This is a follow up to what I’ve been hearing from some folks about how they plan to take in the eclipse of 2017. My family’s headed out for Oregon in a couple of weeks, basing ourselves with relatives in Portland before heading a little south and east in the very wee hours of the 21st. We’re putting ourselves in the hands of the cloud-cover forecast as to how far east we go (or try to), and in those of our cousins for local knowledge of roads and routes. There Will Be Traffic, which is why my hunch is that we’ll be en route not much after midnight. That’s my plan. What follows is for those of you in or near the path of the partial eclipse, and plan to stay there. A total eclipse is a completely different beast from a partial one. 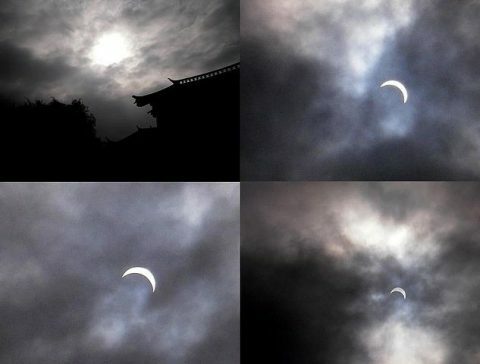 Partial eclipses are weird and cool. Totality is a completely different beast. I had seen a partial eclipse in 1970. A partial eclipse is very interesting. It bears almost no relation to a total eclipse. 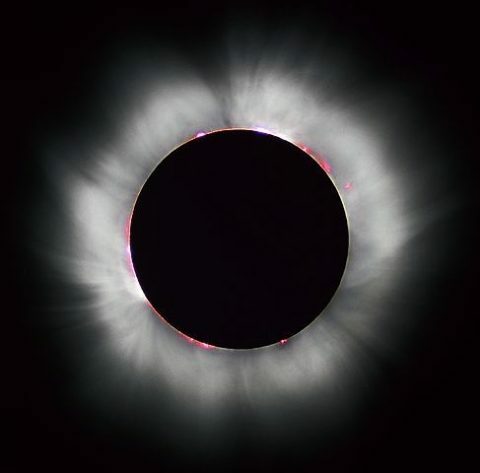 Seeing a partial eclipse bears the same relation to seeing a total eclipse as kissing a man does to marrying him, or as flying in an airplane does to falling out of an airplane. Although the one experience precedes the other, it in no way prepares you for it…. The sky’s blue was deepening, but there was no darkness. The sun was a wide crescent, like a segment of tangerine. The wind freshened and blew steadily over the hill. The eastern hill across the highway grew dusky and sharp. The towns and orchards in the valley to the south were dissolving into the blue light. Only the thin river held a trickle of sun. Now the sky to the west deepened to indigo, a color never seen. A dark sky usually loses color. This was a saturated, deep indigo, up in the air. Stuck up into that unworldly sky was the cone of Mount Adams, and the alpenglow was upon it. The alpenglow is that red light of sunset which holds out on snowy mountain tops long after the valleys and tablelands are dimmed. “Look at Mount Adams,” I said, and that was the last sane moment I remember. From all the hills came screams. A piece of sky beside the crescent sun was detaching. It was a loosened circle of evening sky, suddenly lighted from the back. It was an abrupt black body out of nowhere; it was a flat disk; it was almost over the sun. That is when there were screams. At once this disk of sky slid over the sun like a lid. The sky snapped over the sun like a lens cover. The hatch in the brain slammed. Abruptly it was dark night, on the land and in the sky. In the night sky was a tiny ring of light. The hole where the sun belongs is very small. A thin ring of light marked its place. There was no sound. The eyes dried, the arteries drained, the lungs hushed. There was no world. We were the world’s dead people rotating and orbiting around and around, embedded in the planet’s crust, while the earth rolled down. Our minds were light-years distant, forgetful of almost everything. Only an extraordinary act of will could recall to us our former, living selves and our contexts in matter and time. We had, it seems, loved the planet and loved our lives, but could no longer remember the way of them. We got the light wrong. In the sky was something that should not be there. In the black sky was a ring of light. It was a thin ring, an old, thin silver wedding band, an old, worn ring. It was an old wedding band in the sky, or a morsel of bone. There were stars. It was all over. My own experience was similarly uncanny, impossible to anticipate. The first film that was really mine, the first on which I had sole producer and writer credit, was an episode of NOVA broadcast in 1992 called “Eclipse of the Century.” It documented the 1991 eclipse whose a path of totality tracked directly over the Big Island of Hawaii — and hence over the deep-space telescopes placed atop Mauna Kea. It was a hell of a first film to attempt — we ended up with a crew of over 20, 12 cameras, insurance from Lloyds of London against the possibility that clouds would doom the film — something like $5,000 against $250,000 on four minutes or so of clear skies — and so on. I had a ton of help, of course: a supervising producer, a proper director, a great assistant, and above all, wonderful camera people and their crews, in many ways a who’s-who of the top documentary shooters of the day. Without them the whole farrago would have collapsed in hideous ignominy. For myself — I was with the crew that was filming the adventures within the control room of the Canada-France-Hawaii Telescope. That was headed by Jon Else, for those of you who follow documentary stuff, and though I was nominally his director, Jon needed no guidance from a rookie to do his usual brilliant work. About 90 seconds into totality he turned his head and told me to get onto the catwalk to see the matter for myself. I’m not going to tell you what I felt. As the Dillard passage above suggest, it seems to me, words can carry something of the emotional intensity of the moment, but the experience itself is unsayable. Mimesis ain’t in it here; there’s no representation that captures the reality anyone other than the writer would perceive. In purely descriptive terms, the shift in colors that Dillard describes is the overture, the phenomenon that alerts you to the strangeness under way. But when the moon’s disc fully covers the sun you get something else altogether, a darkness that isn’t quite the darkness of night (especially if you’re high up, with a truly distant horizon, because you can then detect a kind of lightening all around you at the edges of your viewable frame). And most of all, you get the corona, the solar atmosphere. The human eye can see it out to a distance of at least 10 solar diameters, maybe more. But because the brightness falls off so sharply from near the limb of the sun to hte diffuse, outer corona, most most photographs, and certainly in the video linked above, don’t begin to do justice to what you’ll see for yourselves. All of which is (a) to prove the point that words are poor guides to what happens during totality and (b) if you have a chance, check it out. *I can’t find the whole film on the web anywhere. That’s no surprise — in 1992 we weren’t clearing rights for an internet that wouldn’t properly exist for years to come. One cool thing about that eclipse that you’ll see if you do look at the clip were those two giant solar prominences. Don’t see that every time. 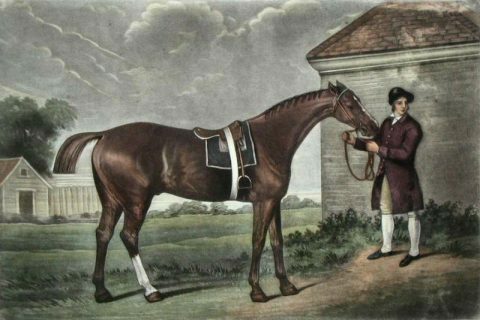 Images: George Stubbs, Eclipse at Newmarket with Groom, before 1789.